Home | Serigraphs and Giclee Fine Art | Giancarlo Impiglia | Giancarlo Impiglia Limited Edition Serigraph on Paper: " Half Past Five "
Giancarlo Impiglia Limited Edition Serigraph on Paper: " Half Past Five "
Image Size: 31" x 42"
About the Art: Giancarlo Impiglia is widely recognized as one of the most influential artists of contemporary Art Deco style. 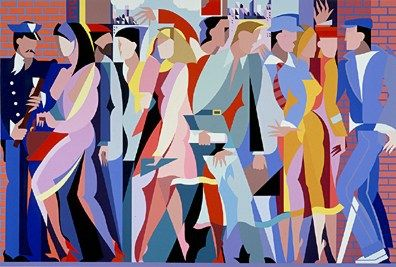 By boldly combining hard-edged, abstract human figures with shimmering colors, Impiglia creates a kinetic vision that captures the rhythm of urban life. He juxtaposes static images with carefully planned and controlled geometric patterns, suggesting movement. This evocative imagery simultaneously conveys the joy, excitement, loneliness and sophistication of everyday life in a bustling metropolis. Impiglia came to New York in the mid-seventies and immediately began painting and expressing his satirical interpretations of the hustle and glitter of New York's bourgeoisie. His subjects span the whole spectrum of society... a multitude of characters from every class. With wit and perception, he defines these characters through their attire, painting suave men in white tie and tails, as well as provocatively-dressed women at gala receptions. His figures are faceless. Personalities are defined only by sharply drawn profiles - a subtle commentary on the anonymity of city living. The works of Impiglia have been extensively exhibited throughout Europe and America, and also form an important part of many private and corporate collections. He is also well-known for his murals which can be seen in many public places in New York City. Home | Fine Art Prints & Limited Editions | Gallery Direct Art is your Authorized Chalk & Vermilion Dealer | Giancarlo Impiglia | Giancarlo Impiglia Limited Edition Serigraph on Paper: " Half Past Five "